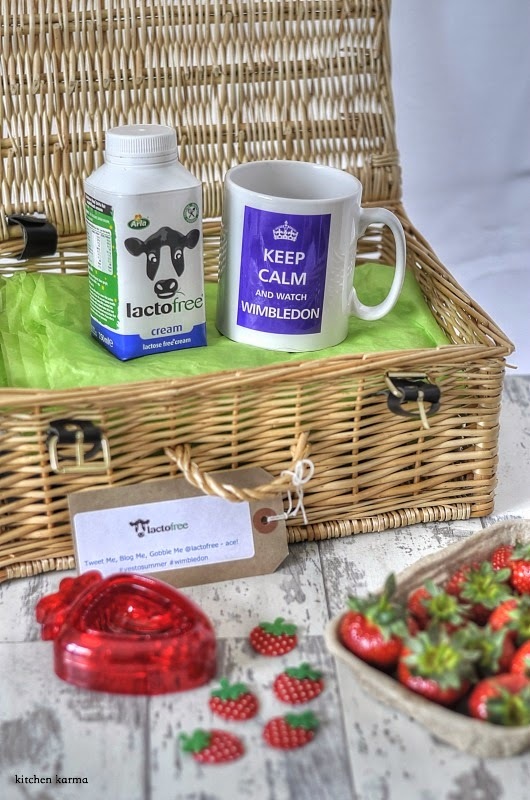 Kitchen Karma: Lactofree Gift Hamper to enjoy the Wimbledon Championships! Just the other day my girl friends were discussing about going to watch one of the Wimbledon matches. Since we live pretty near to the Wimbledon area in London, it would be a shame not to. I am not a big follower of tennis, though used to be a huge fan of Stephen Edgberg and Stephie Graph in my teenages. Then these two retired and tennis kind of lost it's magic for me. Though I keep updated. Loved the excitement around Andy Murray last year, was really stunned at the mean way people attacked Marion Bartoli, instead of congratulating her. So for a dormant tennis fan like me, it was a big tickle to receive this Lactofree gift hamper to enjoy the Wimbledon. Love the strawberry slicer included in the hamper. It is a really cool piece of kitchen equipment. In case you didn't know, strawberries and cream with champagne are a kind of Wimbledon tradition. According to www.radiotimes.com 28,000kg of strawberries, 7,000 litres of cream and 28,000 bottles of champagne are consumed in each Championship. Now that is a staggering number, isn't it? When so much of strawberries and cream are being consumed in the UK right now, how can I be left behind? In case you have a little cream left behind after all those strawberries were eaten and you are wondering what to do with it, please do not chuck the cream. Here is a really nice soup recipe to use up the leftover cream. Thanks Havas and Lactofree for the gift hamper.